2006-- The 11-year solar cycle is at a low point this year, but even during solar minimum, auroras continue. The best display occured on Dec. 14th when a coronal mass ejection hit Earth, sparking Northern Lights as far south as Arizona. July 28 , 2006: "This is solar minimum? Tell that to the auroras that drifted over the horizon here in Wisconsin last night," says Tony Wilder of Chippewa Falls, WI. 2005-- On the verge of solar minimum, the sun exploded! The year began with an intense display of auroras over Europe on Jan. 21. An even stronger storm erupted on May 15 sparking auroras from Alaska to Antarctica and many rare places in between. Amazingly, the best display was yet to come: In September, giant sunspot 798 unleashed nine X-class solar flares, single-handedly making Sept. 2005 the most active month on the sun since March 1991. The auroras of Sept. 11 were spectacular. 2004-- Summer is normally a poor season for auroras, but the summer of 2004 was different. On July 25-27, Northern Lights descended as far south as California during an extreme geomagnetic storm. November was even better: A sunspot wider than Jupiter materialized, crackling with M- and X-class solar flares. These explosions caused widespread auroras. On Nov. 7-10, Northern Lights were spotted in every US state except Hawaii. The view from Sheep Mountain Lodge near Anchorage, Alaska, on Nov. 7, 2004. Photo credit: Calvin Hall. 2003-- This was the year of the "Halloween storms." In late October and November, the sun went haywire. During a stormy two-week period, three giant sunspots unleashed eleven X-flares, including an X-28 monster--the most powerful solar flare ever recorded. 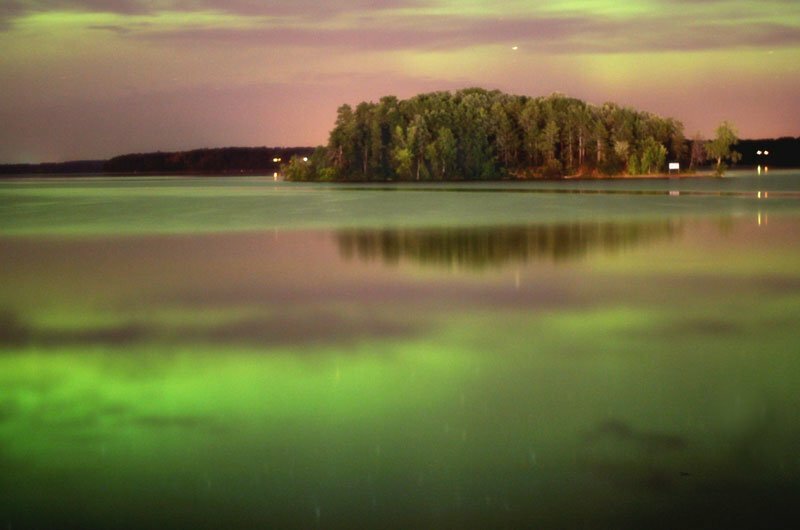 Auroras appeared in Florida, Texas, Australia and many other places where they are seldom seen. Bonus: On March 25 and 27, scientists created man-made auroras over Alaska. Auroras over Big Bay, Ontario. Oct. 29, 2003. "The display was spectacular--the best in two years," says photographer Steve Irvine. 2002-- October 2002 was a remarkable month because it began with a geomagnetic storm that lasted a whopping nine days. During that time sky watchers spotted weird ring-shaped auroras, auroras in Arizona, auroras in Tasmania, and some auroras that were positively spooky. Another date of note: April 19 when Northern Lights descended as far south as California. "The brightness of the auroras was just totally unbelievable," says Jouni Jussila who took this picture from Oulu, Finland,on Oct. 3, 2002. 2001-- The sunspot cycle reached its peak in 2001. There were plenty of solar flares, coronal mass ejections (CMEs) and, of course, auroras. It's difficult to chose a single best display in 2001. There are many dates when Northern Lights were sighted as far south as Texas, Florida, Arizona--even Mexico. Storms of note: April 12, March 31, Oct. 21, Oct. 28, Nov. 6, Nov. 24. "Thanks to Spaceweather.com, we have seen auroras in Arizona four times this year," says photographer Chris Schur of Payson, AZ. 2000-- This is the year of the "accidental aurora." Thousands of sky watchers saw auroras by accident when they were outdoors looking at something else. During an alignment of planets on April 6, the most powerful geomagnetic storm since 1989 sparked Northern Lights as far south as Florida. Months later, during the Perseid meteor shower of August 12, a similar storm occurred. The best view of all, though, was enjoyed by space shuttle astronauts who accidentally flew through some auroras on Sept. 18. Galleries: April 6, Aug. 12, Sept. 18, Oct. 5, Oct. 28, Nov. 3, Nov. 6, Nov. 26-28, 2000. Auroras over the Rosemary Hill Observatory in central Florida. April 6, 2000. Photo Credit: Francisco Reyes.